I know everyone is still recovering from Sunday's Oscar madness, but while we were ogling at Ellen DeGeneres's reigning selfie moment and Lupita's Cinderella finish, The Walking Dead aired one of their best episodes yet this season. Especially if you're a member of Team Daryl Dixon. As I've stated in a previous post, one of the things I love most about this show is that it doesn't tell you everything about a character all at once. Rather, it gives you just enough information about them to keep you intrigued. Which brings us to Sunday's episode, titled "Still," and Daryl Dixon (Norman Reedus). If you've been watching, you already know that the group of zombieapocalyptic refugees were forced to scatter into several smaller teams after a particularly bloody raid, which is where the mid-season 4 finale left off last year. So as the latter half of the season commenced, we learn a lot more detail about each individual character (including the once prudent Michonne). In an especially quiet episode on Sunday, Beth (Emily Kinney), devout daughter of a preacher man, has a desperate craving for alcohol as she finally comes to terms with her own mortality. A wilted flower to Daryl's aggressive and resourceful modus operandi, the harsh dichotomy between the two finally levels off as Daryl's demons come barreling out of the closet by the end of the episode. Those viewers who were on the fence about Daryl's transformation from hillbilly racist in season 1 to empathetic hero may finally come to realize his tortured soul. After the two vanquish more of the undead (with Daryl doing most the heavy lifting) and pass through rooms of decaying zombies hung from nooses in an abandoned house, which added an even more emotionally destitute tone to the episode, the always diplomatic Beth tries to calm Daryl's nerves by inviting him to play the classic drinking game, "I Have Never." I was a bit concerned about where this was all going, only because I do not want to see these two in a romantic pairing. But the writers smartly turned what was expected to be a lighthearted activity into an emotionally candid awakening for both characters. In this interlude, we find out to our surprise that Daryl has been harboring some regrets from his past, growing up in older brother Merle's shadow and essentially basking in a purposeless existence. It was only at the advent of their current living nightmare that allowed him to finally use his natural deviance and devil-may-care attitude to help not only others but himself. But, really, he's just been going through the motions merely in order to survive--nothing more and nothing less. Will his past sins come rushing to the forefront on Judgment Day? While The Walking Dead hasn't hit us over the head with any religious commentary, it is interesting to note the rather spiritual path this episode has taken. 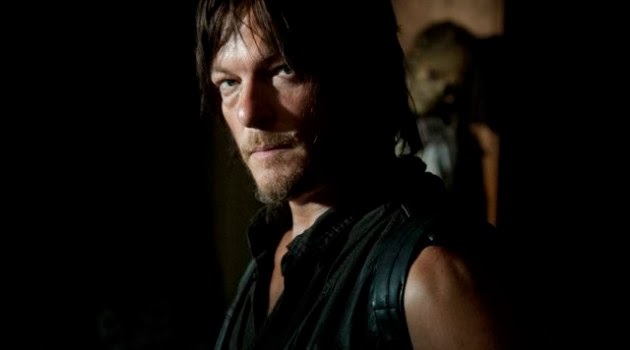 In a show in which we've seen heroes turn to antiheroes and antiheroes turn to villains, Daryl's humanizing turning point was just another example of how we never know what to expect from these characters. We are still learning what makes them tick, cry, and even smile (hey Michonne!). I've ridiculed Beth's gratuitous placement among the characters in the past, but even she was alluring to watch as she struggled with her fears and all but conceded to her own uselessness. The truth is, without the task of caring for eternally stranded baby Judith, she has nothing on which to focus her mind except her own impending death. "Still" was a bleak yet cathartic episode for both characters, and posed the question, "How do we live when we have nothing left to live for?" Capped off with a rather satisfying scene of Daryl and Beth burning down the house where they just finished unveiling souls, "Still" ends with the two moving forward to what we can assume will be the next phase in their emotional and mental journey. You make this episode sound a lot better than I thought it was. lol I hated it. It did nothing to push the story forward and the whole thing really could've been wrapped up in about 20 minutes, and they could've shown us another group of survivors. Plus Emily Kinney's acting was so awful. @Brittani Burnham LOL I think part of it had something to do with my eternal love for Daryl. But I actually love the introspective nature this season has taken. I'm usually not usually a Beth fan, as I mentioned, but I actually thought even she surprised me in this episode.